I saw my first frogfish six years ago in Malapascua, Philippines. It was a giant frogfish, black of course, and I called it grumpy fish. I thought it was cool, and that was that. Fast forward a year later, this time in Oslob one island over, and I found my first frogfish on my own, this time a giant purple one. That was the exact moment I fell in love with frogfish. Never in my wildest dreams did I imagine that this weird fish would evolve into a passion of mine. I never imagined that I would speak at dive shows about frogfish or gather enough knowledge that I would become one of the few frogfish experts in the world. 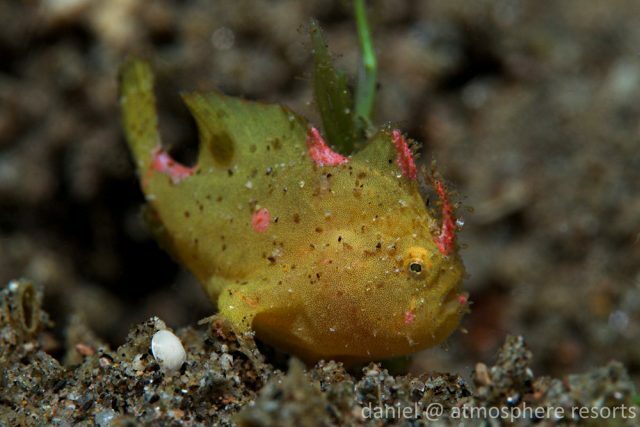 This frogfish, formerly Antennatus sp, is now known as Nudiantennarius subteres. 2017 was an amazing year for frogfish and myself – I had a frogfish photo place in an international competition and I had another frogfish photo make it to the finals in two international competitions. That’s not even the best frogfish news of the year. Born to Be Wild, a TV show in the Philippines, came to Dauin to do a segment on frogfish and invited me to dive with them as well as be interviewed as a marine biologist. A month later, I received an email from the world’s leading frogfish scientist about one of my emails. 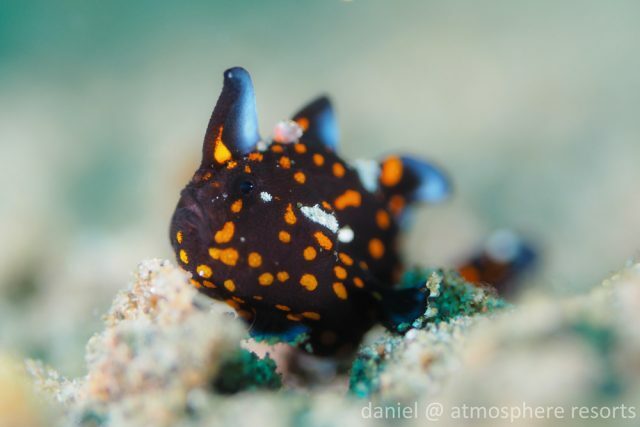 The TV crew had contacted him with questions and he wanted some information about one of my photos, the Ocellated/Lembeh frogfish. 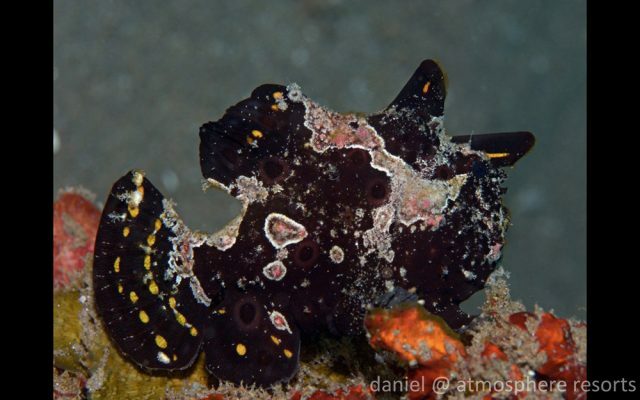 It turns out that he had been trying to figure out the correct species name since in the ID books this frogfish is currently an unidentified species in the genus Antennatus. I sent him photos of around 30 individuals, all different colors, and gave him information about habitat, size, and seasons. Although the black variation is most common, this species actually comes in all different colors. It turns out this is not a new frogfish species, but a previously known species called the Deep Water frogfish (Nudiantennarius subteres). Previous scientists believed that only juveniles were found near the shallows (only a few had been captured for analysis) and that the adults lived very deep, which is why no frogfish of this species had been found larger than 4 or 5 cm. After photos from myself and at least one other diver of matings pairs in the shallows, at sizes of around 3 cm, it was realized that the deep habitat of this species was an incorrect assumption. Additionally, the lure was incorrect in the original drawing, so nobody thought to compare the two different frogfish until DNA analysis said they were the same. The best part about this frogfish news – the editor of the scientific journal Copeia asked to put my photo on the cover of the 4th quarter edition, which as a marine biologist is a bigger accomplishment than a dive magazine cover, which was published online in November and will be published on paper in January. The frogfish news doesn’t stop there! While I was at DEMA, I kind of stalked (successfully) the authors of the “Reef Fish of the Indo-Pacific” book. I’ve had an issue with their book for awhile because I, as well as some of my friends, strongly believe that my favorite frogfish, the one with orange polka dots, is incorrectly identified as a Painted frogfish (Antennarius pictus). I have followed juveniles growing into adults, seen them mating, and been documenting them to back up my claim. I showed about 20 photos to one of the authors, trying to convince him that it is actually a Clown frogfish (Antennarius maculatus). He agreed with me and it will be corrected in the next revision of the book, coming out early 2018, to be replaced with my photo of an adult with the orange polka dot variation. The adult exhibiting characteristics of a Clown frogfish. Hopefully the frogfish news keeps on coming. I’ll be submitting photos to more competitions and actively trying to be published in magazines this year, so who knows what will happen. 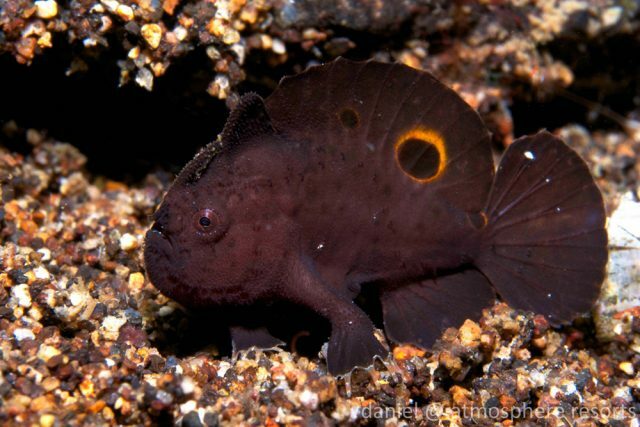 Keep your eyes out for any peso coin pictures popping up on social media, and if you want your daily dose of frogfish and other critters, you can always follow me on facebook (facebook.com/meanguignphotography) or instagram (instagram.com/meanguignphotography).